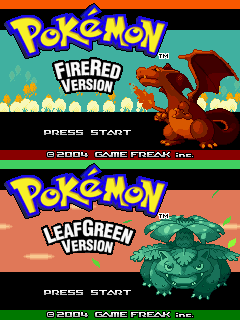 Pokémon FireRed and LeafGreen are remakes of the first two Pokémon games, Red and Green. Aside from the graphics and interface being upgraded to that of Ruby and Sapphire, the games received many new elements, most notably the Sevii Islands. There may be more unused or normally unseen text. A text dump can be found here. 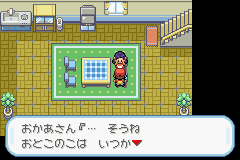 Text found within the game that wasn't translated, some leftover from Ruby and Sapphire. 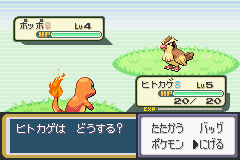 At least Japanese FireRed v1.0 has a sound test, similar to the one in Ruby and Sapphire. Unlike in Ruby and Sapphire, it was removed in the localisations. 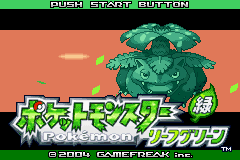 To access it, patch 0x12f342 to 00 00 00 00 and 0x12f35c to 01 FF 09 08 in a Japanese FireRed v1.0 ROM to replace New Game with the sound test (this has the effect of showing the sound test after the title screen if there is no save file). 18.1, 27.0 and 29.0 are three identical unused houses without event data on Routes 6, 19 and 23 respectively. The one on 19 is where the Pikachu's Beach minigame was in Yellow, so it is possible that they wanted to remake it as well. 31.1 is the room hidden behind boxes in the old lady's house on Seven Island. It only has a warp to the room above. 31.5 is an unused house map for Seven Island that lacks event data. It's possible that this could have housed an NPC who would check how big a certain Pokémon is due to the poster on the wall. The prototype 6 and 7 are blank and only one tile big. Expanding the map size reveals one tile each of their original map intact, with collision data to boot; 6 has a surfable sea tile, and 7 has the impassible upper left corner of a sea border rock. This implies that these were fully collisioned maps at some point, but they were "deleted" in the laziest way possible. 8 and 9 still have intact maps with collision data, though they are obviously incomplete. 22, 23, and 24 do not have maps, only headers. They were probably cut early on in development. The area around the Trainer Tower on Seven Island has a LOT more ocean than you ever get to see in-game. What this means is anyone's guess. The infamous truck near the S.S. Anne is back, and the same series of steps (getting a Pokémon with Cut without causing the S.S. Anne to leave, and returning later with Surf) are needed to access it. This time, however, there's a reward for finding the area. A Lava Cookie is out on the dock, accessible much earlier than normal. Several other maps, some of which are corrupted leftovers from Ruby and Sapphire, also exist in the game's coding. 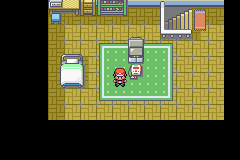 Some of these seem to be early versions of other maps in FireRed and LeafGreen, too garbled to identify, or just duplicates. A complete list can be seen on Bulbapedia, here. Since key items cannot be transferred with a Pokémon, they're unused and most have no effect in FireRed/LeafGreen. The Mach Bike and Acro Bike do work, but act like the normal Bicycle. HM08 (Dive) also works and can be taught to Pokémon, but unlike normal HMs the move can be deleted freely. A lot: Archie and Team Aqua, Maxie and Team Magma, Beauties, Cyclists, Hex Maniacs, Gym Leaders, the Elite Four and Champion, etc. While you can battle them in-game through hacking, their Pokémon data is gone, so they don't have any Pokémon to battle with. Multiple scripts starting at 0x1638EC in the US 1.0 version remain as leftovers from the first Braille chamber, with the alphabet inscribed in pairs of three (ABC, DEF, GHI ...). A room similar to it was likely planned but then scrapped in favor of having a Braille table included in the booklet. Confirm that the PokéNav and Contest effects are in fact unused and not repurposed. Numerous sound effects from Ruby and Sapphire survive, and some music tracks. Moving truck in motion. 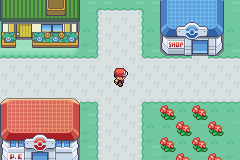 0x616B60 in FireRed US 1.0, 0x616BC0 in 1.1. Coming to a stop. 0x6B61D8 in FireRed US 1.0, 0x6B6238 in 1.1. Finally reaching a stop. 0x6B6204 in FireRed US 1.0, 0x6B6264 in 1.1. The door opening. 0x6B6238 in FireRed US 1.0. Berry picking. Berries cannot be picked in these games. 0x6BD5BC in FireRed US 1.0. Hoenn Gym Leader battle theme. 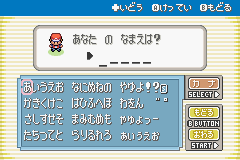 0x6BE9C4 in FireRed US 1.0. Hoenn Trainer battle theme. 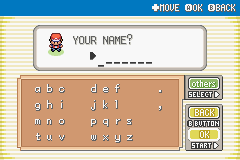 0x6BFA68 in FireRed US 1.0. Pokémon Trainer's School. 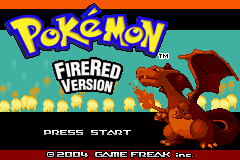 0x6BFDC0 in FireRed US 1.0. While not technically unused, this text requires cheating to be seen. 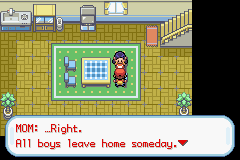 If the player interacts with the TV on the ground floor of his/her house from the sides or the back, the same text string from Pokémon Red and Blue appears. Hacking a TM move to be Bug-type will cause the disc in the TM case to change color accordingly, suggesting that Bug-type TMs were originally planned to appear in Generation III (though it's a bright shade of yellow, rather than green as it is in later games). Colors for nonexistent HM types also exist; however, ?? ?-type has no color, and defaults to Normal-type. These Pokémon overworld sprites are never used in-game. Keitaro posted this on the Jul forums. Investigate and document this further. There are unused sprites for the player surfing that use a Lapras-like blob instead of the generic blob from Ruby and Sapphire that ended up being used in the final release. A chiptune-like version of the Pokémon Healed theme which sounds like the original from Red and Blue was scrapped at some point. It has the title MUS-KAIHUKU in the sound test and its ID is 0119. For the sake of consistency, every Pokémon in every Pokémon game is given a Shiny variant, and Celebi is no exception. However, because the only way to obtain it legitimately was through distributions, the Shiny version of Celebi was left unobtainable through normal means. This sprite may still be seen (in a lighter hue) if a Shiny Pokémon Transforms into a Celebi. Like "standard" Celebi and many other Pokémon, the sprite is identical to that of Ruby and Sapphire, where it was similarly unobtainable. Altering Cave appears in FireRed, LeafGreen, and Emerald. Normally, only Zubat can be found in this cave, however there are other wild Pokémon that can be found if Mystery Gift is used at an official Nintendo "Wonder Spot". Despite this, no such event has been held in any country. The Pokémon that were supposed to be found were Mareep, Aipom, Pineco, Shuckle, Teddiursa, Houndour, Stantler, and Smeargle. The plan was probably scrapped because these Pokémon could be obtained by trading with Pokémon Colosseum, Pokémon XD: Gale of Darkness, and/or found in Emerald's extended area of the Safari Zone (except Smeargle, which is found in Artisan Cave instead). There's also unused text for the Mystery Gift reception of the event-only Pokémon. the rumors are indeed true? Some Pokémon when found in the wild has a chance of holding an item. But several Pokémon can only obtained via evolution or other means, so catching a Pokémon with these items is impossible. Most are copied from what a previous evolution has, and while several held items was changed for these games, Pokémon introduced in Gen 3 have the same held items as in Ruby/Sapphire. Isn't this in Ruby and Sapphire? At 3A64C8 the movement table is located, containing the directions the player or an NPC must move in. However, after the first five entries (steady, down, up, left, right), four more follow, resulting in diagonal movement when activated. Using them results in some glitches with warps and map rendering. This feature was not implemented in any final version until X and Y. Some data suggests wild double battles were originally planned for this generation, but were delayed until Generation IV. For example, a string Wild [buffer1] and [buffer2] appeared! is located at 3fd2bf, and setting only bit 0 in the battle type flag at 02022b4c in the RAM results in such a battle, if used at the right moment. As with the previous feature, it isn't finished and may result in some bugs. There's more source paths, and more interesting text. Near the build date info is a plain-text string showing the build path and a few build variables. The Japanese 1.0 revisions use relative paths instead of the full paths, both the English revisions (1.0, 1.1) have this line in full, and the Japanese 1.1 revisions no longer have this information. 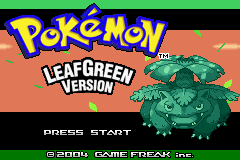 Version 1.0 of the American release does not show "PRESENTS" on the Game Freak logo screen, although the tile graphics are present in the ROM. This was likely due to a bug introduced during the localization process, as the original Japanese versions do display this. In v1.0, species names in the Pokédex only display the first word due to the game incorrectly interpreting the space character as a null terminator. For example, Pidgey's species name is listed as "Tiny" rather than "Tiny Bird". 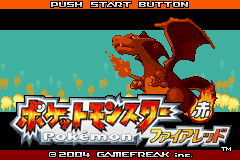 Other than the logo graphics being altered (resulting in Charizard/Venusaur being moved down), the Japanese versions have "PUSH START BUTTON" at the top while the English ones use "PRESS START" in the lower-middle-left side. The Japanese versions format Game Freak's name as "GAMEFREAK inc.", which is occasionally used by the company; the international releases instead use the regular "GAME FREAK inc." formatting of the name. The Japanese versions' name entry screen allows for five-character names with hiragana, katakana, and alphabet tables. The English versions allow for seven-character names with uppercase, lowercase, and symbol tables. The player's bedroom has a Famicom in the Japanese version, but a front-loader NES in the international versions. 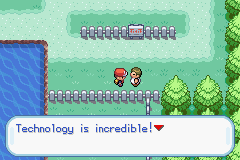 The dialogue text displayed when pressing the A button in front of it was also changed in order to reflect this. The Japanese versions use a font for the "Lv." text and numbers which are very similar to those of the original Red and Green. The localizations change these to the same font as everything else and move the "Lv." to the right edge of the box due to the longer Western words. The "♂" and "♀" symbols were also changed slightly. The Japanese version uses pink or blue text on the title screen menu for the player's progress entry, depending on their gender. 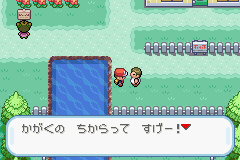 The Japanese versions use black text when talking to people. The fonts used are slightly different between male and female NPC dialogue: for female NPCs, a slightly more wiggly, handwriting-esque font is used, while the font for male NPCs has a more "perfect" modern computer-ish look. 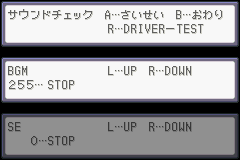 For example, compare the か and の characters in the sample screenshots. The international versions use the pink and blue text when talking to female and male NPCs, respectively. This was also seen in some pre-release media of the Japanese version. In the Japanese version, Trainer Tower was used to fight trainers downloaded from Pokémon Battle-e FireRed & LeafGreen cards. These cards were not released outside of Japan, and so the e-Reader compatibility was stripped from the US and European versions. Trainer Tower became an area similar to the Battle Tower in Ruby and Sapphire, with the majority of the trainers from the e-Cards integrated into the game itself. Ever wondered what that door in the house on Seven Island that had boxes over it was used for? 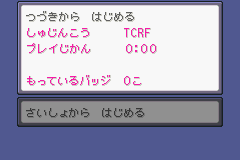 In the Japanese version, the old woman hosted battles with trainers after players used the Mystery Gift, an element which was not carried over to the international versions. Take screenshots of this. This may not have even been used in the Japanese version: see here. In the Japanese and English releases of FireRed and LeafGreen, there is a glitch that makes it possible to obtain infinite Nuggets in Route 24. The Team Rocket Grunt that is at the end of Nugget Bridge gives the player a Nugget prior to battling. 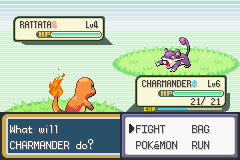 However, each time the player loses against the Rocket Grunt, he or she is given another chance to battle the Team Rocket Grunt; he gives out a Nugget each time he battles the player. In the European releases, this was fixed so the player only has one chance to fight the Rocket Grunt, regardless of the outcome. This is also the behavior in the original Game Boy games. Pocket Monsters: Suuji o Tsukamaeyou! This page was last modified on 28 March 2019, at 15:59.